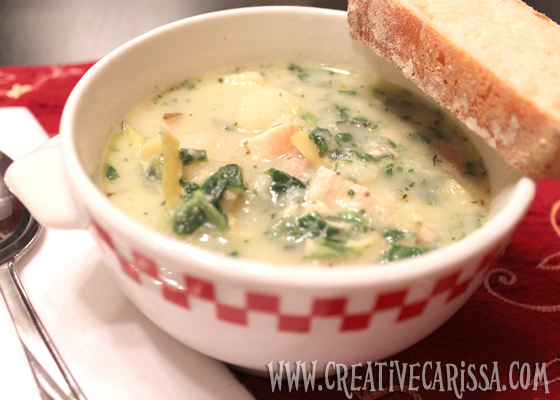 I was on a hunt last week for the perfect spinach and artichoke soup and found this one from Rachel Ray. Using it as a base, I made a few tweaks and added leftover chicken for heartiness. And it was darn tasty. My husband who does not really like soup had 3 bowls. It's that good. Put the potatoes in a large pot of cold water. Salt the water and bring to a boil. Lower the heat and simmer until fork-tender (about 15-20 minutes). Drain the potatoes and set aside. Back in the pot, melt the butter into the EVOO over medium heat. Add the onion and garlic and cook until soft (about 5-7 minutes). Add the boiled potatoes and milk and use the back of your spoon to mash together. Season with oregano, pepper, salt and thyme. Add chicken broth and bring to a low simmer. Stir in artichokes, spinach and chicken. Cook until heated through, stirring throughout. Stir in Parmesan. Garnish with cheese on top and serve with crusty bread.